Narrowband communication networks are deployed to monitor, control and maintain critical industrial processes and distributed assets. Such applications require high reliability and availability especially at the access point, thus driving demand for high duty cycle solutions with built-in redundancy that are capable of continuous operation. The MDS Master Station is built to meet these demanding requirements. The MDS Master Station offers two transceivers in a 1+1 redundancy, and dual power supplies to maximize network availability. In the event of a failure the controlling logic switches to the standby transceiver unit. Switchover can occur based upon transceiver error codes, loss of communication over a configurable time period or loss of power. The MDS Master Station supports two types of transceiver modules. Orbit licensed or unlicensed transceiver modules enable the latest generation performance, networking, and security offered in the MDS Orbit platform. SD licensed transceiver modules enable the deployment of MDS SD Series networks. Additionally, they allow for backward compatibility with x710/x790 legacy networks. The MDS Master Station is built on a cutting-edge hardware framework to offer exceptional reliability for critical communications. 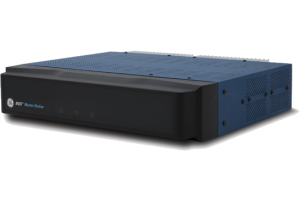 It can be configured as a 1+1 system with redundant power supplies and transceivers that are hot-swappable to ensure always-on operation and maximize network availability. Other components such as duplexers and alarm cards are also modular and can be field replaceable for ease of maintenance. The Master Station utilizes a variant of the GE MDS Orbit network Operating System (Orbit OS) offering future-ready security, networking, and quality of service capabilities. The MDS Orbit OS offers a comprehensive cybersecurity framework to facilitate the deployment of highly secure networks. Orbit’s firewall ensures protection at Layer 2 to 4 to permit only valid traffic through the network. Its RF encryption secures communication between remote and AP while its IPSec VPN and DMVPN capabilities enable end-to-end encryption between remotes and control center. RADIUS enforces a centralized authentication process where users are granted access based on pre-authorized roles and access level. MDS Orbit OS enables the Master Station to offer dynamic and static routing services as well as fully managed switch capability for maximum flexibility in network design. In addition to 1+1 transceiver protection, Orbit OS offers other High Availability mechanisms when used with MDS Orbit remotes such as interface bonding, Spanning Tree, Layer 3 failover, VRRP as well as latency and packet-loss based failover. Quality of Service enables the granular classification and prioritization of traffic as well as the dedication of uplink throughput on a per-application basis to minimize latency and maximize bandwidth for critical applications. The MDS Master Station may be configured with SD transceiver modules in a non-redundant or redundant mode of operation. SD transceiver modules utilize a similar radio technology as the industry-leading MDS SD Series radios to enable communication with MDS SD remotes, as well as MDS x710 and 2310/4310 remotes. The MDS Master Station has been designed to replace MDS 2100 and x790B masters and to provide a seamless evolution path to an all SD network. This backward compatibility allows the seamless co-existence of legacy and SD-based networks. Furthermore, when operating in the CPFSK A modem, the Master Station with SD radio modules can communicate with MDS Orbit remotes operating in a legacy backward compatible mode to facilitate the migration of legacy networks to Orbit-based technology. Once all of the legacy remotes have been replaced with Orbit, a field conversion is possible utilizing the same firmware already on the master station along with swapping out the SD radio modules for Orbit radio modules. This can allow for more flexibility and control over cost and schedule compared to alternative forklift or higher cost full master station migration options. The MDS Master Station may be configured with the latest generation MDS Orbit licensed radio modules covering the 100, 200, 400, 700, or 900 MHz bands. Orbit radio modules enable communication with the MDS Orbit MCR/ECR remotes using its high-performance radio technology with up to 64-QAM of modulation and up to 50kHz of bandwidth. Its bi-directional adaptive modulation, as well as IP header and payload compression, maximize upstream and downstream throughput. Dynamic Forward Error Correction (FEC) boosts link sensitivity to maximize distance and operation in tough terrains. interference avoidance and very low latency 900MHz unlicensed technology. Capable of supporting higher bandwidth applications by providing scalable data rates from 125Kbps to 1.25Mbps. The MDS Master Station with its Orbit OS supports standards-based SNMP and Netconf network and device management protocols for easy integration into MDS PulseNet and 3rd party NMS software. It can be configured and managed using Command-Line Interface (CLI) or an intuitive Graphical User Interface (GUI).